When shooting a bow, every little detail matters – from the type of bow you use to your technique. And everything starts with the way the body is placed when letting go of the arrow, the stance. In this article, we’ll go over the body alignment options and some very simple steps to follow in order to assure proper archery stance when handling your bow, be it a recurve, compound or longbow. Proper stance is critical because it’s the moment when you set your stability, posture and body alignment. Therefore, you should pay your stance special attention and take your time when figuring the correct body position to achieve optimal results. Step by step guide for proper archery stance. There are two basic types of stance to consider, one which is great for everybody that’s beginning to learn proper technique in archery and the other is a more advanced one. This one is as easy as it gets. With the feet shoulder-distance apart, the body is in line and completely perpendicular to the target. The easiest way to check is to make sure that your toes and the target are in the same line. This is the recommended stance for beginners because it’s very simple to get right every time and it gives the archer enough time, stability and space to learn proper technique and figure out what works best for him or her. Open stance is when you literally “open” your body in relation to the target. For example, for right-handed shooters this means moving their right foot a bit in front of the left, opening their hips to the target. The great thing about open stance is that there’s more space in which you can handle your bow, but it takes more work and practice to repeat it exactly the same every time you shoot. Many shooters and bowhunters prefer it, as it’s more dynamic and offers more visibility on the target. Whether you opt for square or open stance, body direction and posture are essential. You need to make sure that your body is straight and strong before you release the arrow. This means that your hips are in line with your shoulders, that you’re not leaning back or forward, and that your entire core is engaged. It also needs to be incorrect direction according to the target. For example, if you’re right-handed, that means your left shoulder will be closer to the target, and vice versa. There’s a simple test you can do when choosing the perfect body direction, which is drawing your bow once you’re in the correct posture, you close your eyes, and rotate slightly from your core from left to right a couple of times. After that you return to what you feel is your center, check where the target is, and re-align if necessary. The body weight should always be distributed evenly, and the core should be actively engaged to assure stability and balance. The moment you feel you’re leaning forward or backward you should stop and re-align your body weight and posture. What helps is to open the feet a bit and distribute the weight evenly throughout the length of each foot. However, make sure you don’t stress your feet or your ankles, as this foot position might not always feel natural and can do more damage than good if exaggerated. The recommended stance distance, especially for a beginner, is shoulder distance. It’s the universal distance that offers great stability, feels natural and doesn’t stress any joints or body parts. However, not always is there enough room to keep your feet shoulder distance apart. When in such circumstances, it is perfectly fine to keep your feet closer together to adapt to the space reduction. From hips down you should definitely adapt to whatever situation you’re in, but hips up should ideally always be aligned, straight and strong. 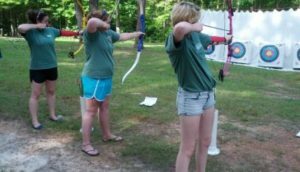 Proper archery stance is of the utmost importance when using a bow – it’s the frame from which the arrows are shot, and to assure maximum accuracy and the best possible technique it needs to be correct and strong. Once you decide which is the best posture for you, the key is to build muscle memory. And there’s no other way to achieve it other than practice. It might seem tedious to be checking your posture every time you get ready to shoot at the beginning, but developing proper stance is the base to your accuracy and overall effectiveness as an archer or a bowhunter.